"Since 1979, America's Largest Independent Ceiling Fan Retailer. We manufacture our own brand of ceiling fans under the Gulf Coast Fans and TroposAir brand and they are sold through our own 44-Retail Locations, select lighting showrooms and online through our own websites as well as online through Amazon and Home Depot." Dan's Fan City was started in 1979, by Dan Hibbeln Sr. and his partner Georgia Wood in Clearwater, Florida. On many trips from his native state of Michigan, he noted the growing interest in ceiling fans being used to help cool the home and combat the energy crisis. The very first location in Clearwater, FL was opened the day after Thanksgiving and is still in operation today. Within 4-months it became necessary to open a 2nd location in Seminole, FL which is also still in operation. Dan's Fan City continues to grow today and currently operates 44-stores throughout a 7 state area as well as placement in select lighting showrooms throughout the country and via online channels that ships product worldwide. Initially, Dan's Fan City utilized existing ceiling fan suppliers such as Hunter, Casablanca, Emerson, Fasco, Encon, Gulfcoast Fans, Union Fan Company and Fanimation. Dan established a strong bond with Gulf Coast Fans which was established back in 1973 and was located in Safety Harbor, Florida right nearby the first location. 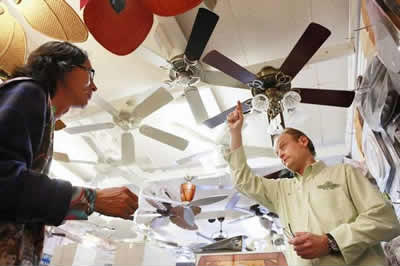 Gulfcoast Fans was one of the first companies to supply ceiling fans to retailers throughout the United States with parts supplied from Taiwan and assembled & packaged here in the United States. In 1983, Dan's Fan City purchased Gulf Coast Fans so that he could begin to give the customers a new experience in purchasing a ceiling fan allowing him to differentiate themselves from the new big box retailers such as Home Depot & Lowes and to control quality. The idea of the ceiling fan in the box gave way to a new customer experience in which the customer now can choose the style/finish of fan then choose from a variety of blade options and they can add lights or accessories if they choose. Through this purchase, Dan was able to establish strategic partnerships with specific manufacturers that saw his vision and still continue this relationship today. This allowed Dan's Fan City to specify how our ceiling fans are being built, utilizing larger motors to move more air, precision sealed bearings to for more efficiency and durability, die cast rotors to prevent electrical noise and electrostatic paint process on the finish to offer one of the most durable and long lasting finishes in the industry. This vision of building the best quality ceiling fan inthe market remains in effect today and allows us to provide the best warranties in the fan industry. The continued growth of Dan's Fan City forced the company to invest in a state of the art warehouse and office that was completed in 1987 to keep pace with our growth. In 2015 we completed another major expansion of our warehouse facility along with a completely redesigned truck bay capable of handling not only LTL but high cube shipping containers as well as improving product flow throughout the warehouse. The vision of our founder is being carried out today by the second generation while the third generation continues to learn the business. Our mission continues to remain focused on offering the best quality with the largest selection of ceiling fans and accessories in the industry today.